At the graduation, this old man was selling balloons and bubbles! 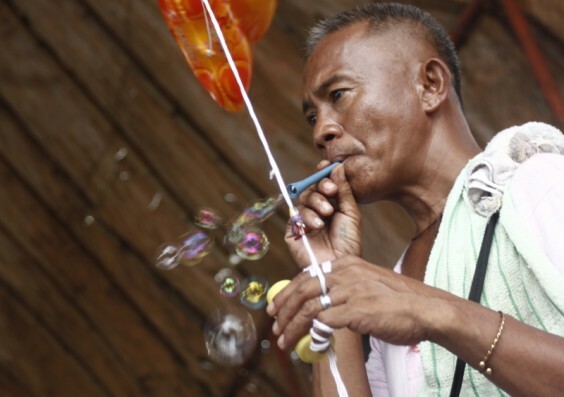 To entice the children to buy, he would blow bubbles that attract kids to his corner without him having to move to sell his goodies. Upon seeing the bubbles, kids literally would flock and play….and eventually drag their parents to his side of the gym to buy a bubble set. Ingenious marketing. Because the gym had a lot of people, I opted to crouch on the ground to take a shot of him with the ceiling as the background. 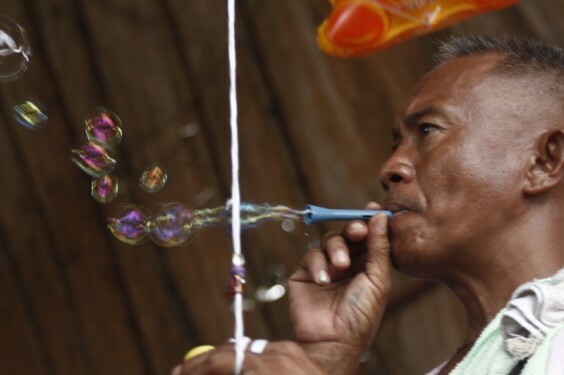 My first shots were of him blowing bubbles with all the people in the background looked so clustered that you can hardly concentrate on the bubbles. Needless to say, I was not happy with it…so I moved back, got on my knees and angled my camera upward towards him. Manong was situated in an area where the sun’s light is abundantly reaching him but because of the roof, it kinda softened the harsh lines the light might have caused. I positioned my back towards the sun while manong was kinda facing it. ai oo teh, i forgot. 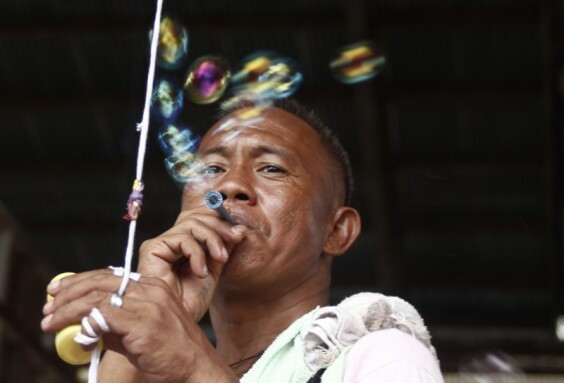 i should have gotten a photo where I focused on the bubbles and not manong…sa sunod!!! :) will arrange my depth of field char. thanks olan. you said you will teach me landscape photography. bantay lang jud ka! i like that the bubbles are blurred to indicate its moving/floating. I cud also make the same setting ate leah, if i were there. pero if you want na ang bubbles clear (ambot) murag magpataas ka ISO para makacommand kag faster shutter speed na dili ngit2x ang output sa photos (hehehe murag korek noh?). ooohhh…kung taas og iso kuya, noisy na siya noh? naa jud digital noise. whats the ISO of these photos leah? i think you can still manage a 400 ISO on this with minimal noise. I am thingking of the 1/40 shutter speed kc, kaya anything that moved a bit cud make a blurred effect. 1/100 and above ok na cguro pero it wud be under exposed. so wala ka mabuhat dear kung dili magpataas gamay sa ISO, unless ur lens cud manage a wider fstop say 1.8 or 2.8.
really, really nice. your photos find beauty in those fleeting moments of life. in an instant, in a mere glimmer of your eye, those beautiful moments occur. and, your expert eye and photographic skill captured it. no small feat.